A 15-minute interlude in the evening program, this unique event showed that collaboration between humans and robots can work perfectly. Maestro Bocelli, was exuberant in his praise of the performance. 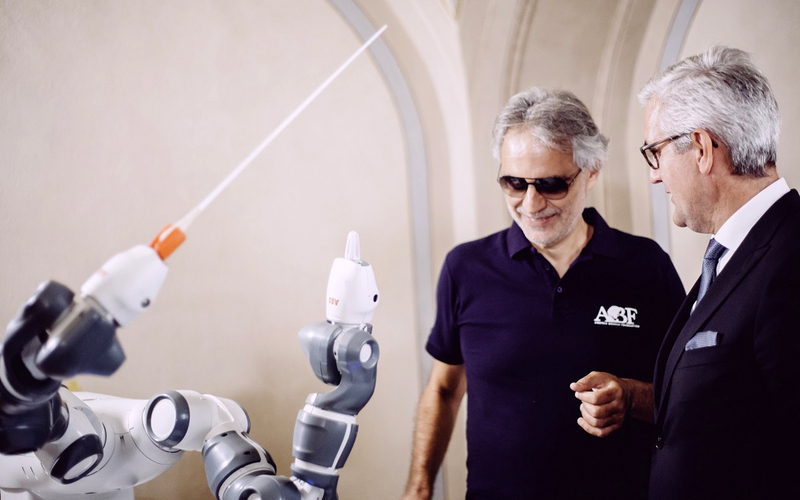 “It was so much fun to perform with YuMi, ABB's collaborative robot. It showed that a robot could really conduct an orchestra, but only with the excellent work of very talented engineers and a real maestro. Congratulations to the team that pulled this off,” he said afterwards. Conducting an orchestra is one of the highest forms of art – it is about shaping the diverse voices of the musicians into a single expression in service to the composer. YuMi is one of the highest forms of robotics technology, changing the way the world looks at human-robot collaboration. The two forms coming together so smoothly during the performance is a testimony to the evolving nature of how man and machine can work together in entirely new ways. 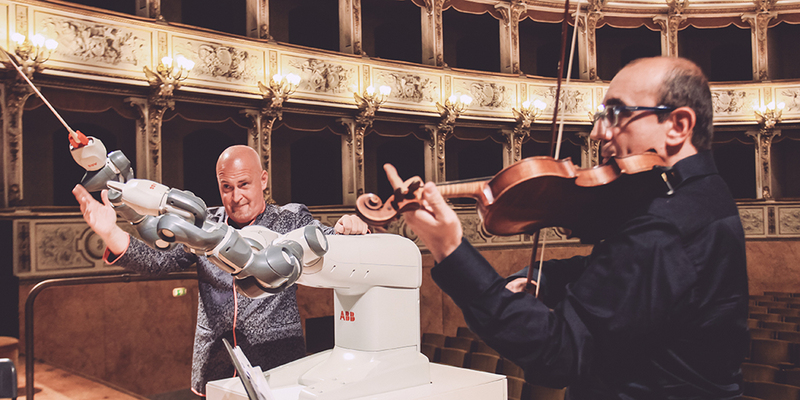 Maestro Andrea Colombini, director of the Lucca Philharmonic Orchestra, who helped prepare YuMi for the event, was excited by YuMi’s sophisticated technology. “Setting up the interaction between the elbow, forearm and wrist of the robot, making use of its versatility in repeated and demanding attempts to break down the upbeats and downbeats, was very successful,” he said. The gestural nuances of a conductor have been fully reproduced at a level that was previously unthinkable to him. YuMi achieved a very high level of fluidity of gesture, with an incredible softness of touch and expressive nuancing. This is an incredible step forward, given the rigidity of gestures by previous robots and proves how easily YuMi can be programmed to do the most delicate jobs in electro- mechanic assembly. YuMi’s performance was developed in two steps. In rehearsals, Colombini’s movement were captured with a process called “lead-through programming,” where the robot’s two arms are guided to follow the motions with great attention to detail; these movements were then recorded. The second step involved fine-tuning the movements in ABB’s RobotStudio software, where the motions were synchronized to the music. 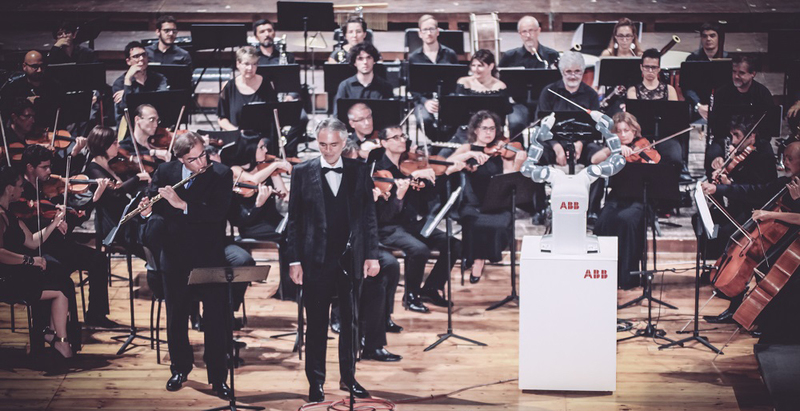 With ABB’s technical expertise, the lead-through programming let Colombini focus on doing what he does best, bringing the music to life. The first International Festival of Robotics has been a place for spreading awareness of robotics, and of robotics applications, including collaborative industrial robots like YuMi. 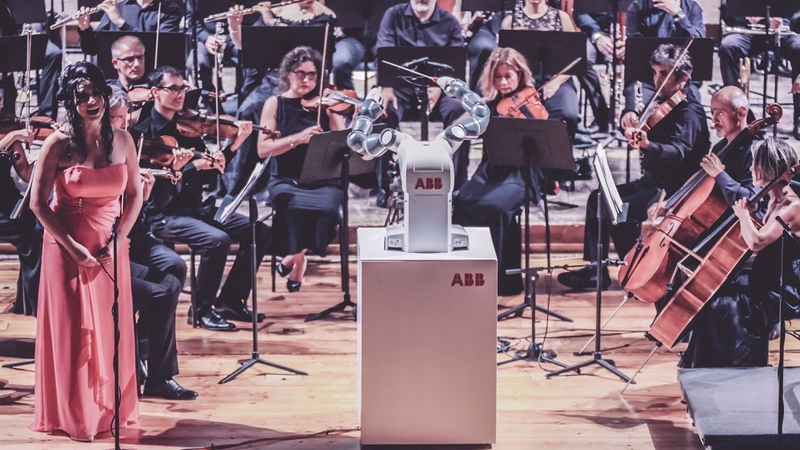 While this performance gives an inspiring peek at the future, it is unlikely robots will ever prove capable of combining the scholarship, artistry, technique, interpretation and charisma of a skilled human conductor. The simple goal is to develop industrial robots that are easier to use and perform better with less human intervention.